Posterior shoulder tightness is common in patients with shoulder injuries. The shoulders are the most commonly injured site in swimmers, suggesting swimmers have tight posterior shoulders. It is believed the posterior capsule is responsible for the tightness in the posterior shoulder, leading to the glenohumeral internal rotational deficit (GIRD) and type 2 superior labrum anterior and posterior (SLAP) lesions, the most predominant type in overhead athletes. Rotator cuff lesions are also common in the overhead athlete, making the combination of posterior shoulder tightness and rotator cuff injury common. 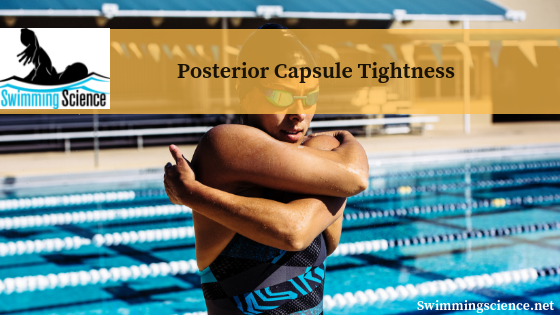 This study looked at the influence of posterior capsule tightness, by measuring GIRD, in throwers with a shoulder injury. Sixty-one patients who underwent arthroscopic surgery were enrolled retrospectively in this study. All of the patients were male pitchers with atraumatic injuries. Then the groups were split into those with GIRD (50 patients) and 11 patients without GIRD, a deficit greater than 20 degrees. During surgery, the posterior-inferior joint space was examined arthroscopically. Then, the posterior capsule and posterior band of the inferior glenohumeral ligament were checked for stiffness and loss of elasticity. If determined stiff, the posterior capsule was resected. Rotator cuff tears were also noted and compared between two groups, posterior (between the supraspinatus and infraspinatus) or anterior (anterior aspect of the supraspinatus). No difference was noted between the rotator cuff tears on the tight or non-tight shoulder groups. However, the tears on the anterior aspect were more common in the tight shoulder group. Long head biceps (LHB) lesions, superior glenohumeral ligament (SGHL) injury, and subscapularis tendon injury showed significant differences between the tight and non-tight group, while the middle glenohumeral ligament (MGHL) injury showed no significant difference between groups. SGHL injury was detected in almost all the shoulders with the LHB lesions. Subscapularis tendon injury was found in 4 out of 6 non-tight shoulders with LHB lesions, but never seen in tight shoulders. Differences between throwers with posterior capsule tightness and without showed differences in shoulder lesions. Anterior SLAP lesions and rotator cuff tears were common on the anterior aspect of the supraspinatus in the tight shoulder group, while the rotator cuff lesions (LHB lesions) were more frequent in those without tightness. The distinction between of posterior shoulder tightness and posterior capsule tightness is essential, but not recognized in this study. However, the finding of the anterior supraspinatus lesion more common in those with SLAP lesions and those with posterior tightness, because SLAP lesions are not as common in swimming due to the lack of extreme shoulder external rotation (peel back). Therefore, the posterior cuff and subscapularis lesions are likely most common in swimmers. Nakagawa S, Yoneda M, Mizuno N, Hayashida K, Yamada S, Sahara W. Influence of posterior capsular tightness on throwing shoulder injury. Knee Surg Sports Traumatol Arthrosc. 2012 Jun 23.